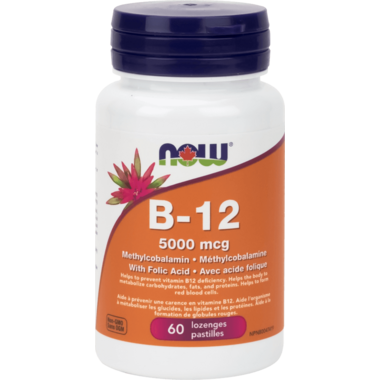 NOW Foods Vitamin B-12 Lozenges with Folic Acid provides you with this water soluble vitamin necessary for the maintenance of a healthy nervous system and the metabolic utilization of fats and proteins. Vitamin B-12 (Cyanocobalamin) is also essential for the synthesis of DNA during cell division and therefore is especially important for rapidly multiplying cells, such as blood cells. In addition, adequate intake of Vitamin B-12, along with Folic Acid and Vitamin B-6, encourages healthy serum homocysteine levels, thereby supporting cardiovascular health. Because Vitamin B-12 is found predominantly in animal products, strict vegetarians are at risk of developing Vitamin B-12 deficiency and may benefit from supplementation. NOW Vitamin B-12 is vegetarian/vegan (non-animal derived). NOW B12 Lozenges also contain 400 mcg of folic acid to boost red blood cell production. These natural fruit flavoured Lozenges can be chewed or used sublingually under the tongue. This high potency product can help energy levels. Directions: Adult Dosage: Take 1 lozenge daily. Hold lozenge in mouth until dissolved. Consult a health care practitioner for use beyond 6 months. Non-Medicinal Ingredients: Fructose, Sorbitol, Microcrystalline Cellulose, Stearic Acid, Citric Acid, Natural Flavour, Natural Raspberry Flavour, Silicon Dioxide, Lecithin, Natural Cherry Flavour, Maltodextrin. Caution: Consult a health care practitioner if you are pregnant or breastfeeding. I really like this particular product, especially when I'm stressed, it works really well for me. Highly recommend and I will continue to buy from Well. One of the few B12 products I can find that is both sublingual and 5000mcg. It dissolves easily and has a pleasant flavour. I love this product and will certainly buy again. These taste great and grateful for the potency of the pills. Will definitely purchase again in the future. I love this product because it does what it's supposed too, I am really a true believer of this product..Thank you Well.You are amazing and for selling products that are true to their name.. Excellent product; higher levels of energy noted and an incredible taste!